1/2 cup brown sugar, 3/4 cup water, 2 Tbsp cocoa, 2 1/2 cups brownie mix (half of a 21.5oz pkg), 1 egg, 1/4 cup peanut butter, 1 tablespoon soft margarine, 1/4 cup water, 1/4 to 1/2 cup milk chocolate chips, if desired. Combine 3/4 cup water, brown sugar, and cocoa in a saucepan. Bring to a boil. In the meantime combine the remaining ingredients in a small bowl. Whisk together or mix well with a spoon.Spread the batter evenly in the bottom of a lightly buttered slow cooker/Crock Pot. Pour boiling mixture over the batter. Cover and cook on high about 2 hours; turn heat off and let stand for about 30 minutes. 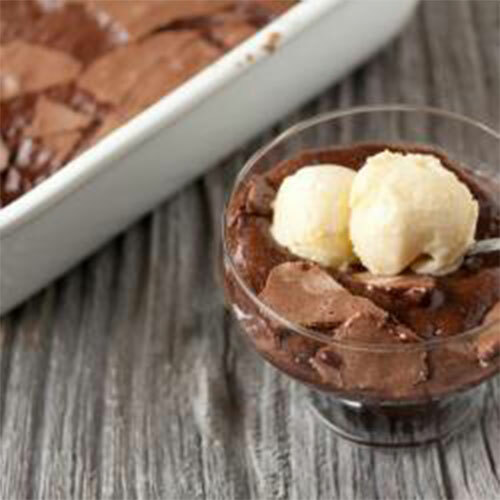 Spoon into dessert dishes while warm; serve with whipped cream or ice cream.